A peaceful little village in the Darien region of Colombia, Sapzurro offers something special to intrepid travelers. 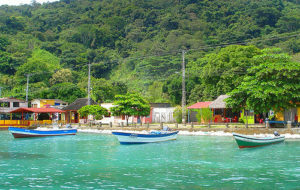 The town itself is located in the shallow bay shaped like a horseshoe, and is teeming with coral reef. The setting for Sapzurro suggests a stay filled with swimming, snorkeling and relaxing under the sun. The town ís white sand beach and crystal waters is enough reason to spend a couple of day here. But don’t forget that this Colombian town is in a remote spot with no roads, and thus, no cars. It is home to less than only 1000 people. But it is the simple houses, intersecting pathways adorned by flowers and the laidback living that truly makes Sapzurro special. Sapzurro is located very close to the bigger town of Capurgana. Most visitors tend to choose Capurgana the base for their exploration of the Caribbean side of Colombia. But Sapzurro makes a nice alternative home base, especially if you really want the feeling of getting away from it all. As you may have imagined, there are no large resorts around the village. 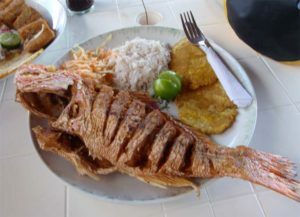 There are adequate restaurants that feature home cooked meals, most of which are seafood-based. But this simple yet very fresh food is one of the best things about visiting Sapzurro. While here, don’t miss out the chance to partner your seafood with the arroz de coco, which is coconut blended rice. As for accommodation, you will most likely have to stay in small yet cozy hostels. From Sapzurro, you can arrange a day trip to the neighboring tiny village of La Miel by boat. 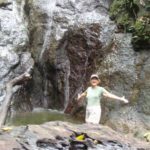 However if you are feeling more adventurous, it is also possible to just hike through a forested hill to reach the village that is just over the border of Panama. And since you are going over the hill, you will be greeted by nice views of the countryside and the Caribbean. By stepping in La Miel you are literally coming into another country. The border crossing experience is quite unique as you will have to check through a hut shared by the Colombian and Panamanian immigration officials. Take note that if you plan to do such excursion, remember to bring your passport with you on the journey. So why should you bother going to La Miel? The main reason is its outstanding white-sand beach, considered to be one of the most beautiful in South America. La Miel Beach is bigger than the ones in Sapzurro. It is ideally fringed with palm and coconut trees. The surprise is that this beach has remained low-key and uncrowded, unlike other beaches in the Caribbean, because of its remote location. As mentioned, one of the major activities in Sapzurro is hiking. If you are up for a challenge, you can take on the jungle trail that goes all the way to Capurgana. The journey takes about an hour and a half and goes over the mountain. Another hiking destination, which features a shorter route is Cabo Tiburon or Shark Cape. The route takes you along the coast and can be completed in half an hour. Cabo Tiburon offers plenty of snorkeling and freediving opportunities. It is also extra special because this is the coastal border between South and Central America. If a nice set of cascades is something that you would like to see, then the Diana Waterfall definitely a place you to visit while here! One of the most important things to remember when traveling to Sapzurro is that the village has no ATMs. It is also hard to find one in the surrounding region. Businesses in town do not accept credit cards, so the safest thing to do is to bring enough cash in local currency or USD to last you during your stay. For a map of Columbia, go here.